Yes. The answer is yes, I’m insane – I don’t need you to put it in the comments, but please do it anyway. I’ve fallen so far off my rocker I may never be able to get back up. But that’s okay. 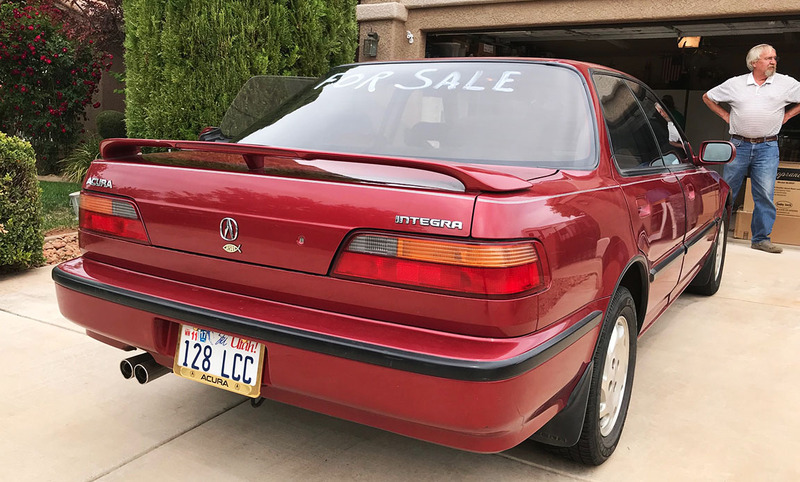 I thought I’d spice up this blog with an unexpected twist and buy an Acura Integra nearly identical to the one I already had. Why not, right? I already have twin Desert Mist Metallic 1994 Legends. RS: Basic as basic comes! GS: LS trim + anti-lock brakes, power moonroof, alloy wheels, and map lights. Ooooh! All 3 are powered by a 140-horsepower, 1.8-liter dual overhead cam 4-cylinder motor. No VTEC here: The sedans did not get the same engine technology that the GS-R 3-door hatchback did. I was definitely NOT in the market for a replacement Integra when this one came along. To the contrary, I was greatly enjoying restoring my 1992 LS that I went to great lengths to buy, transport. and clean up. But luckily, thanks to my Bring a Trailer auction, I was able to find a new owner for that one who will really enjoy it. Ken flew in on Sunday morning and drove the car home to Denver, Colorado. As much as I enjoyed that LS, when a one-owner car comes along with extensive ownership history and all the goodies of a top trim level, you bust a move. So thanks to my friend Jeff for sending it my way, and to my friend Cody for driving over to check it out – including a FaceTime session with him and with the owners. Here are the photos from that day. 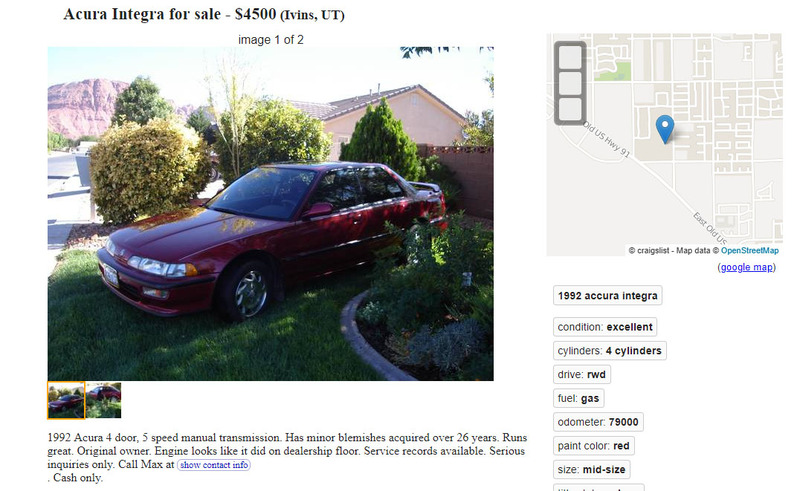 Screen shot of the original craigslist ad. FaceTime sesh! Yes, I did. Chris, this pic’s for you. This car comes to my collection from a sweet gal named Maxine who lives in southern Utah. 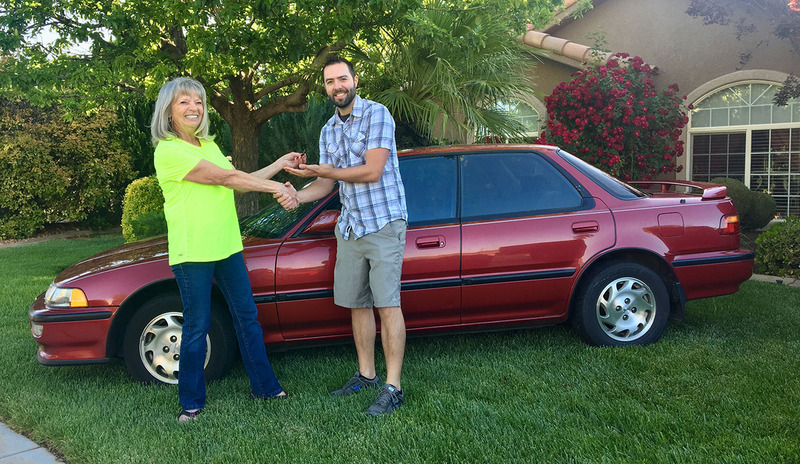 She bought the car brand new off the showroom floor in the Seattle area 26 years ago at Bellevue Acura. 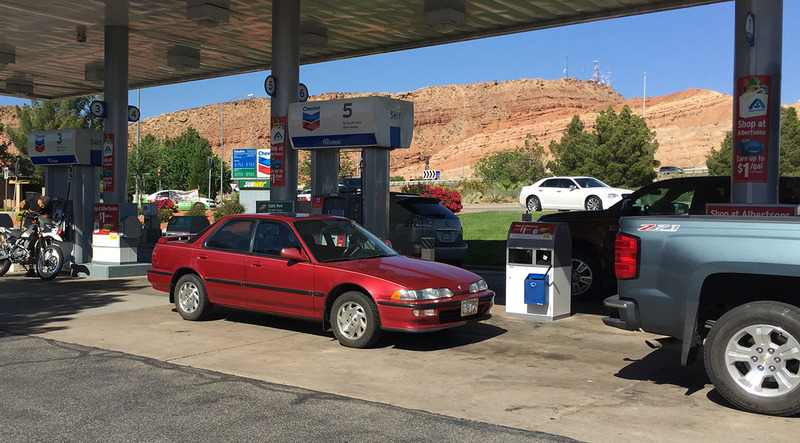 I caught a flight to St. George, Utah on Monday evening, May 7, and spent the night at mom’s place before heading over to Max’s on Tuesday morning for the transaction. I was a little apprehensive, as is always the case in the hours leading up to the purchase of a new car. It was about a 30 minute drive to Max’s place in Ivins. The car was already pulled out of the garage and ready to roll when we arrived. Max was understandably a little emotional about the event – and for good reason. She’d owned the car for maybe half her life? It’s a big deal to part with something so sentimental. 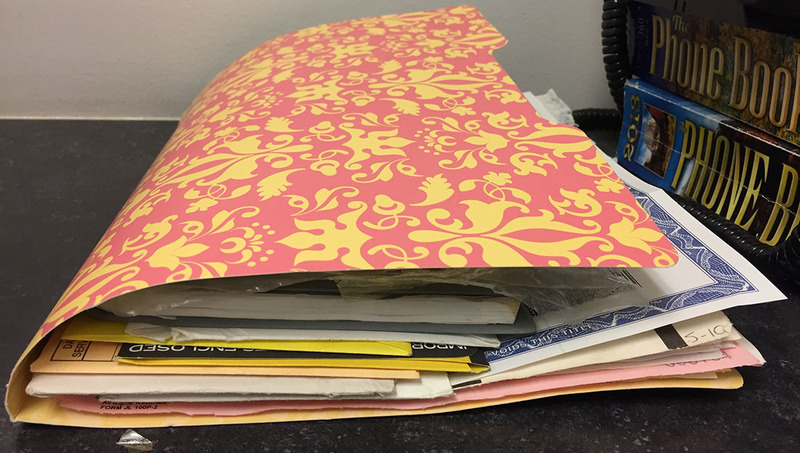 After taking a few traditional key handoff photos, we went through a folder of paperwork dating back to when the car was new. You all know how excited that gets me. 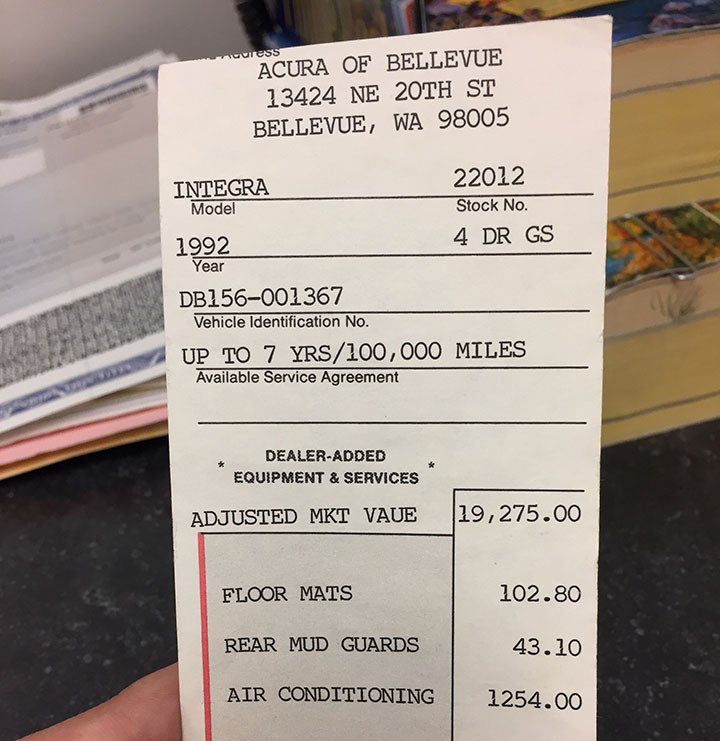 She had the original window sticker, service receipts, even a slip of paper indicating the commission amount that salesman David Wright made on March 12, 1992. It was $285.00. 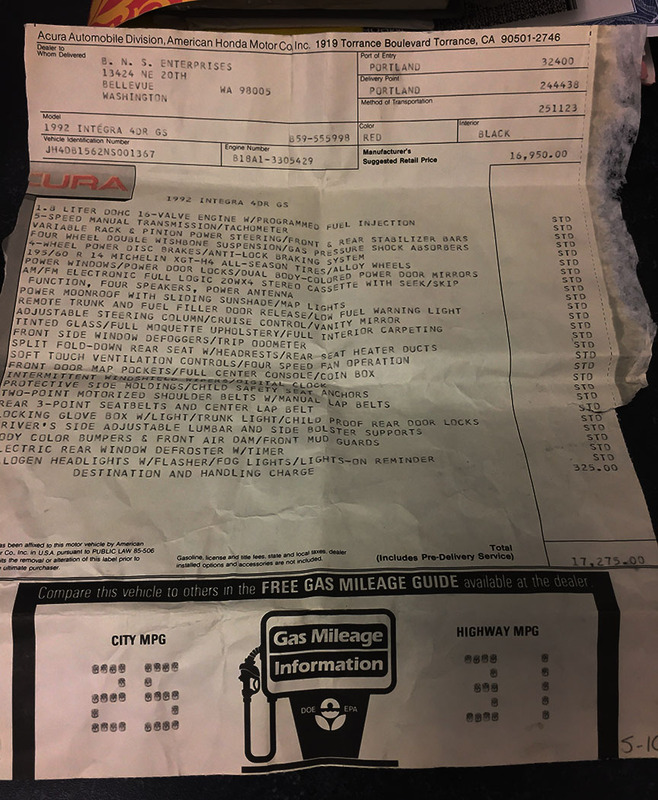 Oh, and I also found a Vehicle Service Contract dated March 30, 1993 at 26,741 miles that was good for 84 months or 100,000 miles. By the mileage standard, the car is STILL covered! Haha. First stop before even getting the revs beyond about 2,500 RPM was the Honda dealership a few miles away. 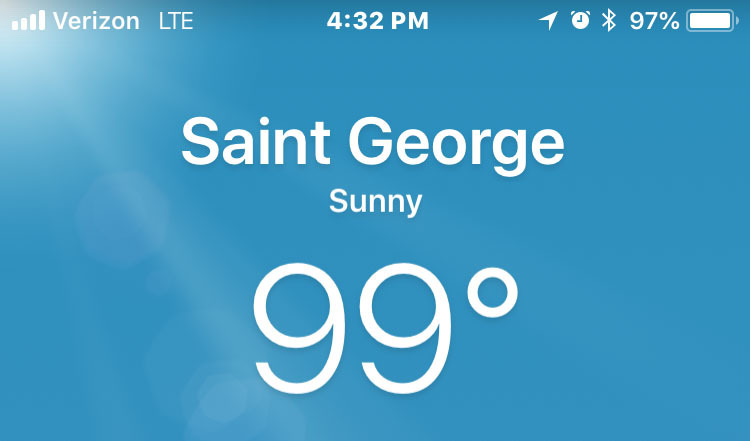 I’d pre-arranged with the Service Department to take care of a timing belt & water pump change for me – not one to risk driving 400 miles on an old belt in 100+ degree temperatures. 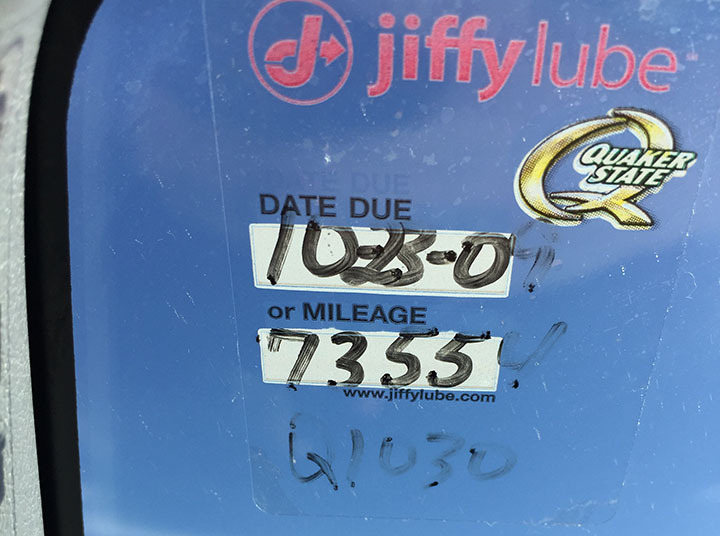 The oil change was also far overdue – with the last sticker from Jiffy Lube on the windshield dated 2009, nine years ago! The service technician reported that the timing belt was “yellowed and crispy” (yikes) so I was glad I had it changed. Interesting – this car was marked up $2,000 from the MSRP! $19,275 instead of $17,275. Toasty day to be heading out! 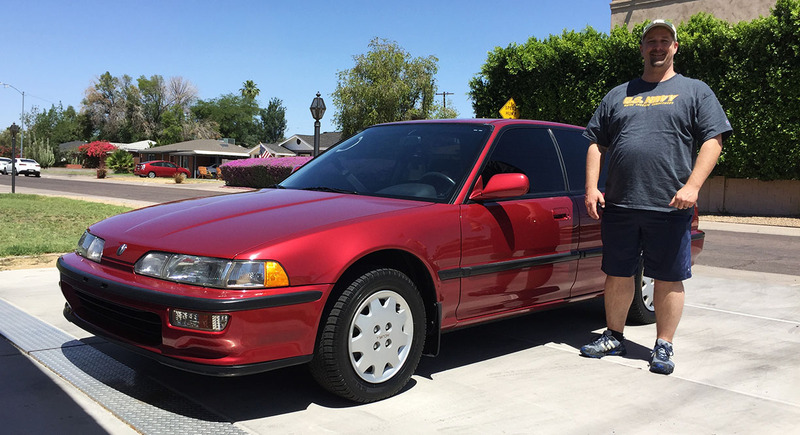 Just for kicks – check out this 6-minute video my friend Hy and put together last weekend of his immaculate Accord SE as I was invited to roll a milestone with him. And one more, from just this past weekend. I went junkyarding with my friend Michael – check out his really nice 1990 Legend L sedan with only 60,000 miles on it. That ought to keep you all busy for a few days. Have a great one! 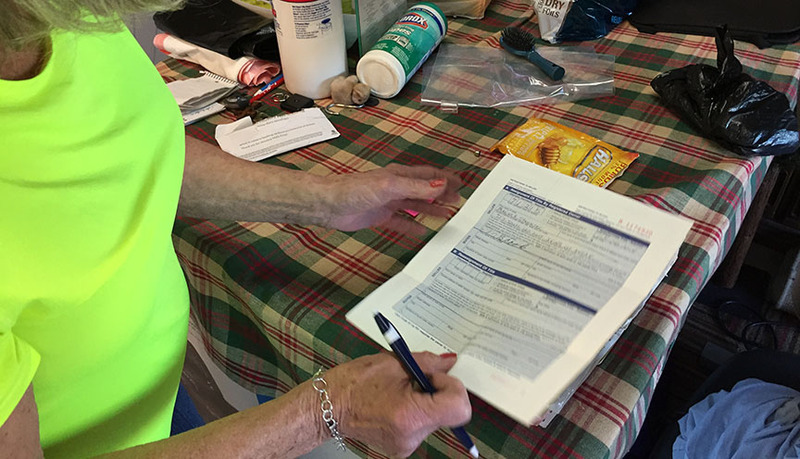 This entry was posted on May 30, 2018 at 7:28 am and is filed under Integra, Utah. You can follow any responses to this entry through the RSS 2.0 feed. You can leave a response, or trackback from your own site. Your face on the facetime looks dazed and confused, classic haha. I already know what happens in chapter 2 but I can’t stand the anticipation of whats to come. You are cray cray, but if I don’t see an Acura SLX in the garage within the next year or two, I’m going to be seriously disappointed in you. 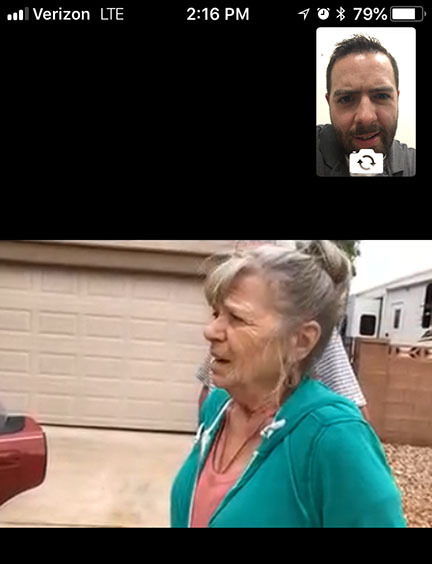 Haha, I hate FaceTiming, but if it’s a necessary step in the purchase of a new car, I will swallow my pride and do it! I haven’t been on the SLX hunt for a while – maybe there are some new ones out there waiting to be scooped up. For now though, I’m taking a break from buying & selling to let my credit card recover a little! Omg. You found snakes in the trunk — right? Haha, that would have been an easier and less expensive problem to deal with than what I ended up with! A yellow and crispy timing belt does not sound good. Did the tech spot any leaks while they were deep-diving into the engine? Cool write-up. Congrats on the new car, although maybe not, after that ominous ending? We’re sitting on the collective edge of our seat in antici…pation! Well, the end of the story is a happy one at least – the new car is home safe and sound and I don’t regret the purchase one bit. 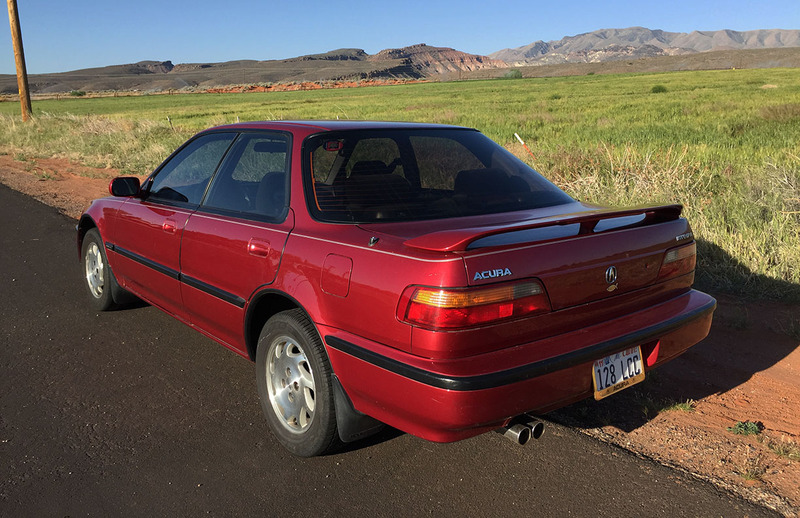 But there were some adventures along the way – just like with the last Integra sedan I picked up! Ahhhh, the thrill of hunting down and purchasing a new car. The new Integra GS looks ultra clean, it’ll be a neat car to have in the collection. Have you ever had a quick add of your combined car mileage? 1,261,099 based upon your pictures above – and that’s not including the ILX! 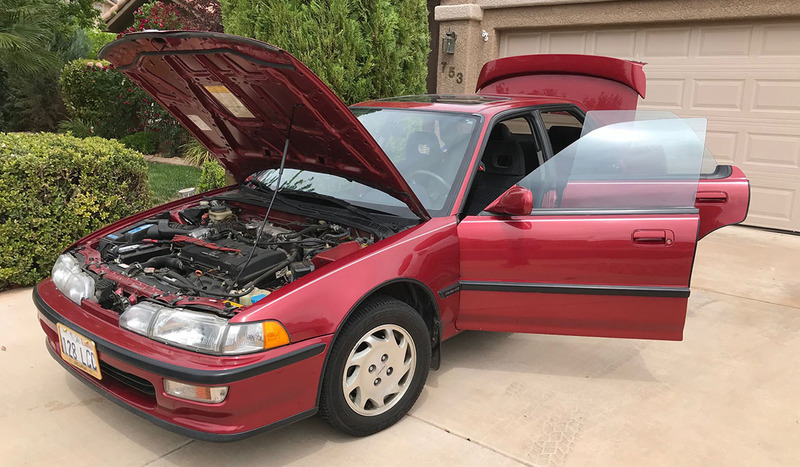 Hy’s 1993 Accord is in superb condition, I remember us having one back in the early 90s – I’ll have to hunt some pictures out. 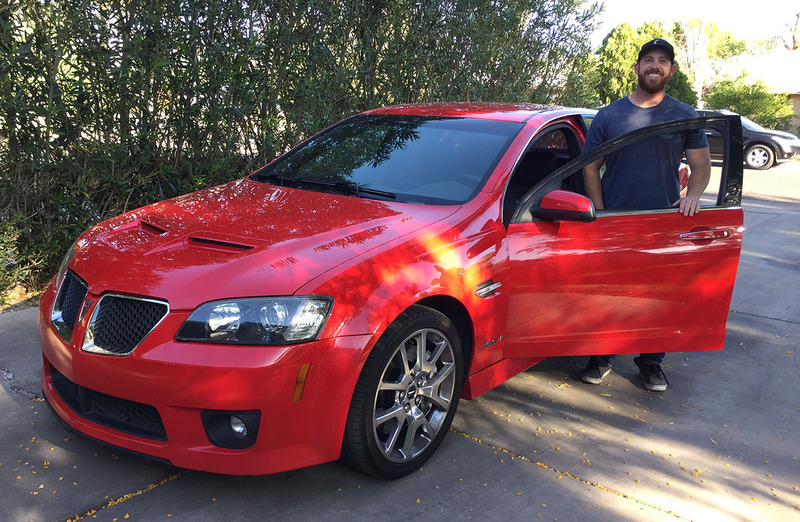 Kyle’s Pontiac is a neat piece of kit too – my colleague at work has the same car, albeit branded Holden Commodore, with the 6-speed too. The times I’ve been behind the wheel, it’s got some pretty good horsepower. I’ve had a busy week with the Fairmont spending a few days in the dealership, but collected it tonight – only to use it to collect (tow) my sister’s fiancee’s car – which had broken down. He didn’t want to be in the “towed” car, so I took the reigns. Took a fair bit of work to wrestle the car the 40-odd kilometers into town with no power steering or power-assisted brakes. Looking forward to hearing about part 2 of the misadventures of bringing an old car 400+ miles home. Sounds like you’ve had some fun automotive adventures of your own in recent days & weeks. Looking forward to reading about them. I can just picture you in the ‘towed’ car trying to keep things pointed in the right direction without power steering and power brakes, haha. Thanks for doing the math on my mileage totals; I hadn’t gotten around to that! Looks like a great purchase though, definitely understand the appeal of the higher trim, one owner, lower mileage example. Glad you got that one and the LS went to a good home too! I know, seriously. Multi-part stories seem to be my ‘thing’ this year, haha. A little bit of drama every now and then is what owning old cars is all about. Gotta love it. Haha, quiet! Just kidding. Yeah, the craigslist post was kind of funny for a few reasons. They also listed the mileage incorrectly as 79,000, so I was pleased that it was only 71,000. Did you really call me out in your blog? Lol! I think you should’ve snagged the CD player in the Vigor! Blow the dust out and try it! Haha, you bet I did. And you’re right… actually, I bet that CD player single-DIN would fit in the Integra GS and look somewhat factory! Might even be the exact same one that Integra would have had. Have a good weekend. Hey Tyson I’m betting most car guys don’t think you’re Cr@Zy!? I can think of one anyway…. Looks like u guys found some rare models at the pick ‘n pull. Definitely surprising to see a Vigor & CB7 but guess if you don’t go you’ll never know. You bet! And hope you can join for the next trip to the pick & pull. Nah you aren’t crazy at all. 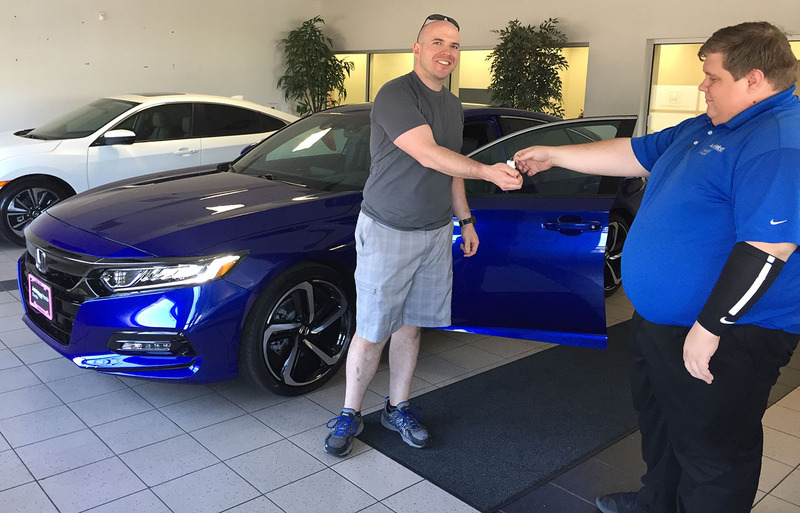 Congrats to you, Jim and Kyle for picking up some sweet rides. I love the fact that the Accord is offered with a manual. Looking forward to Part 2, but seriously, what are the odds you would find the exact same color with lower mileage? And so close to you too! I know, seriously. I still can’t believe the GS popped up. Getting ready to launch Part 2 right now! Stand by.